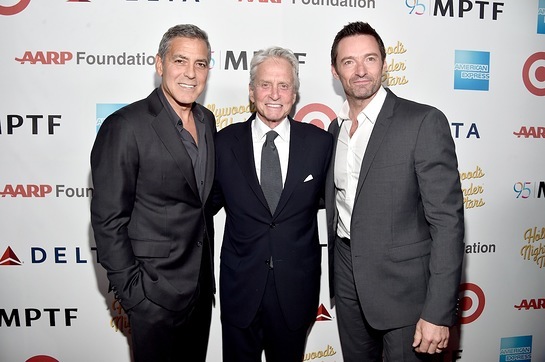 During the weekend, George Clooney hosted MPTF's (Motion Picture & Television Fund) “Hollywood’s Night Under The Stars,” an evening of musical performances and special presentations celebrating their 95th year of helping those who entertain us. Matt Bomer, Yvette Nicole Brown, Bryan Cranston, Loretta Devine, Michael Douglas, Kate Flannery, Derek Hough, Hugh Jackman, Norm Lewis, Jane Lynch, Johnny Mathis, Chris Pine, Sheryl Lee Ralph, Jeremy Renner, and Kevin Spacey also appeared at the event, which took place at the MPTF Wasserman Campus in Woodland Hills, CA. It was presented by AARP Foundation, American Express, Delta Air Lines, and Target, with in-kind support from Casamigos, Heineken, Monsieur Marcel, Red Truck, and Sprinkles. The show was filled with musical highlights including a medley of Les Miserables classics headlined by Hugh Jackman, Helen Reddy (an MPTF resident herself) singing “You And Me Against The World,” Johnny Mathis singing his hit “Misty,” and a show stopping performance of “Listen” from Loretta Devine that brought the audience to its feet. Television and Broadway star Norm Lewis gave a powerful performance of “Music of the Night,” and Kevin Spacey delighted the crowd with performances of both “Can I Steal A Little Love?” and “Mr. Bojangles,” complete with a top hat and some smooth dance moves. The evening also featured some more sentimental moments, including personal stories from the MPTF residents delivered by film and television stars Jeremy Renner and Matt Bomer. Bryan Cranston and Chris Pine shared the stage to recount their familial connections to the MPTF campus – Cranston’s mother and Pine’s grandmother were both residents who benefitted from the services of the facility and support and compassion of its caretakers. The night concluded with a triumphant performance of “Somewhere” by Johnny Mathis and Norm Lewis supported by a full choir. The event also marked the launch of MPTF’s “ALL IN” Program, which was introduced by long-time MPTF supporter and volunteer Yvette Nicole Brown. 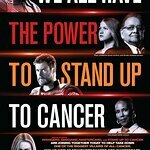 The ALL IN campaign will help to share MPTF’s message across all members of the film and television industry, and connect with the next generation who will carry on the organization’s mission. The event was chaired by Ann & Jim Gianopulos and directed by Richard Jay-Alexander. Jay Landers produced, and Emmy-winner William Ross served as musical director, conducting a 17-piece orchestra.